Odd, strange and disturbing news is everywhere. As the weeks go by, I find myself collecting a series of news items and internet tidbits that are odd, strange or simply out of line. 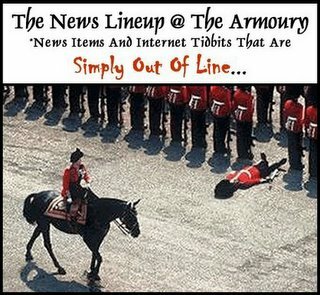 Hence, I will periodically offer them up in posts called “The News Lineup @ The Armoury.” By the way, in the picture above, the soldier has passed out as a result of being in formation for some time. If his condition were actually serious, I wouldn’t have used the picture - it’s a good thing that they wear those heavy duty, fury helmets! Something like this could only happen in a litigation crazed society: Did Jesus Exist? As always, men continue to invent something that is “novel” and “new” - but it’s the same old thing: the Devil’s in the denim? 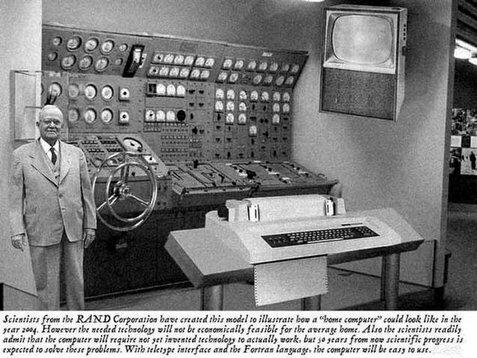 This is a Picture from a 1954 Popular Mechanics Magazine which forcasted what a home computer would look like in the year 2004. Be sure to read the text below the picture (complete with a steering wheel). Finally, a computer that is inferior to the iMac ;-). (If you are a Mac owner - please be sure to note the smiley face...I don't like doing smiley faces, but for you I made one!). This is a good link to consult whenever you receive an e-mail or read news that may seem to be out of line:www.truthorfiction.com. Yet another contest over intelligent design, now this one is in California.